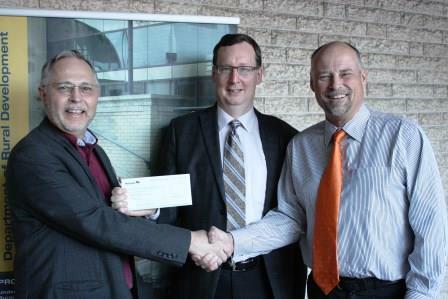 BRANDON, MB – The Rural Development Institute (RDI) at Brandon University (BU) today received $110,000 in funding from the Manitoba government, to assist in new community initiatives including a study of opportunities in Manitoba’s food processing industry. The installment is the third in a five-year, $545,000 funding agreement between RDI and Manitoba Agriculture, Food and Rural Development (MAFRD). Signed in 2012, the partnership supports RDI’s research and education programs which bring rural issues to audiences throughout Manitoba and the world. Dr. Bill Ashton, RDI Director, says MAFRD funding has contributed to important studies, including revitalizing downtown Brandon; an extension survey of the military training trenches dug during World War l at Camp Hughes, a National Historic Site; and water quality in Killarney Lake. A provincial conference on land use last month in Brandon drew over 300 planners, municipal staff, elected officials, economic development officers, and guest speakers.